Yep. I'm going to have a good crack at it this year. I'm determined and I have good intentions. What could possibly go wrong? I'm going to primarily take the photos with my phone so I won't have to drag around camera equipment around with me. And I'll totally use filters to make the photos look decent! So, to keep my interest levels up, I made this little button yesterday. It took me ohh, about 2 hours. I'm certainly no Photoshop whizz. 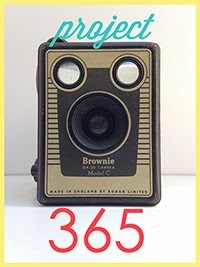 And yep, that's my little vintage Box Brownie I picked up years ago off eBay for about $10. Try getting one for that price now. Here's a little button if you want to add it to your blog and play along as well. You just need to right-click then save it. I can't wait to see what 2014 brings me and my little family, but expect to see lots of dodgy camera photos! Yay! Good on you Beth! I have never been game to start, cause I just don't think I could carry it through. Although, I need to upgrade my phone soon and was researching best cameras on phones! 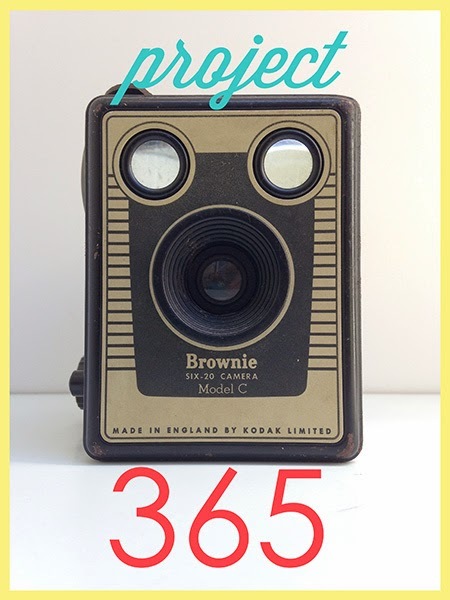 Are you going to have a go at Project 365 Becc?